Wanna give your baby a fun, safe and educational toy? Wanna the price to be more affordable? –This is what HAHA Baby is doing. We aim to provide toys with reasonable and affordable price which could help 0-3 years kids to improve their recognizing, learning, speaking and coordination skill by interact with parents. 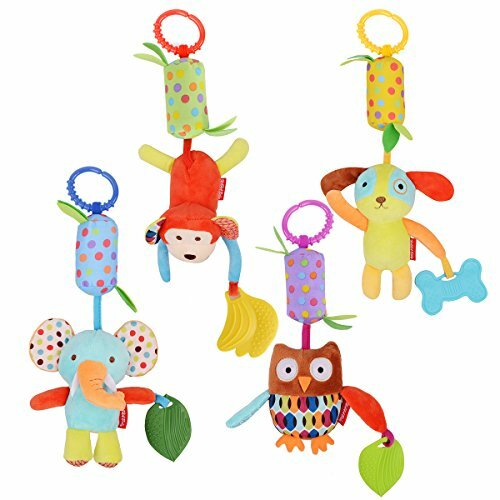 4pcs Hanging Baby Rattle Toys Set! This baby rattle collection is a great value. There are 4 different hanging bell rattles, each are colorful and differ in shapes. Each rattle is unique and fun to play with.Your baby will love playing with so many rattle toys! For ages under 3 years old. Colorful animal wind chime with rattle sounds will delight the babies and help strengthen baby’s sensory skills and gross motor skills. Fun at home or on the go! 1. Care instructions: hand wash or wipe with a damp cloth then natural air drying. 2. Need wash before first use. May slight color deviation due to different displays. 3. Do not tear the toy with force. Use under the adult’s Supervision. Do not keep the small parts of the toy in mouth in case baby swallow it. 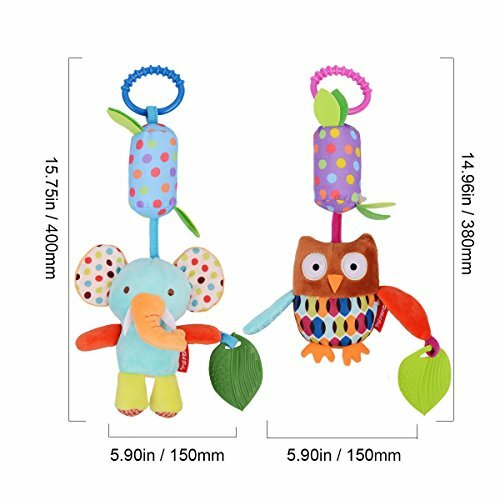 PERFECT COMBINATION TO DEVELOP BABY ABILITY-HAHA Baby stroller toys come with 4 different animal designs which includes elephant, owl, dog and monkey. Bright color, cute design and high contrast patterns help to stimulate baby’s visual abilities. 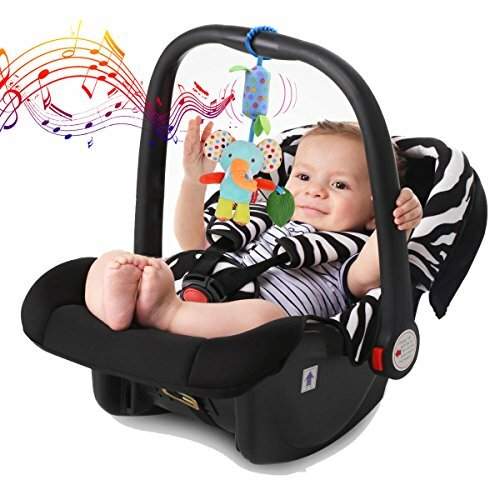 SOFT VOICE TO ATTRACT BABY-Each car seat hanging toys has a built-in wind chime which makes a soft, cozy and soothing sound by gentle shake,help parents to play with babies and help to promote your babies auditory senses as well as muscle and grab ability. This baby toy set will keep your baby busy and entertained. 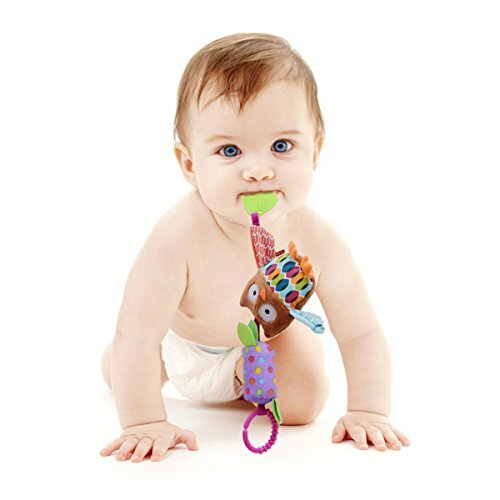 TEETHING RELIEF WHICH IS SAFE FOR BABY-There has a teether on each toy allows your baby holding it to chew on that help to ease baby’s toothache while teethers come out and training baby’s hand-eyes-mouth-brain coordination as well. 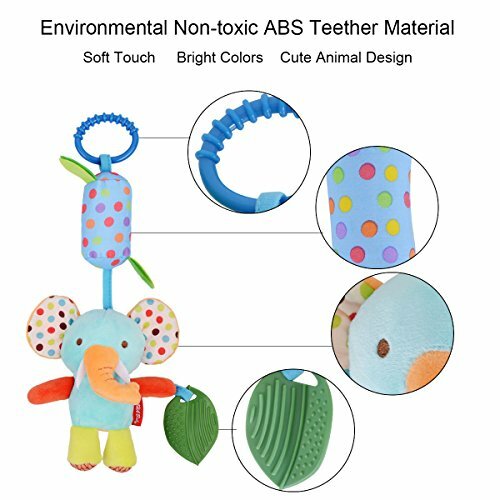 Absolutely non-toxic and safe, BPA free material, no harm for babies. 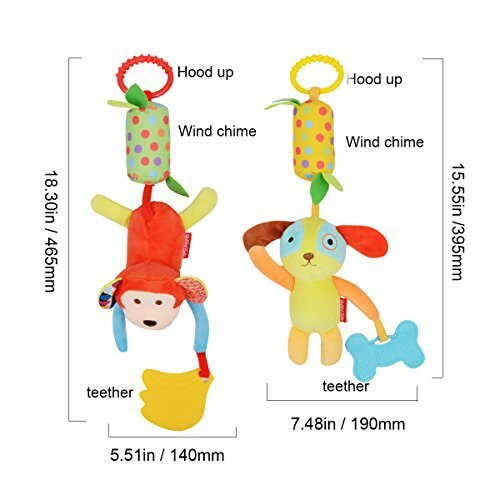 EASY TO USE-These infant rattle toys with a C clip on the top and the inner size is L1.65″*W1.34″, very easy to hang on or take down from the car seats, strollers, prams and beds. Hand wash with warm water or wipe with a damp cloth before first use.